3 minutes 10.55 seconds, that’s the current Singapore national record for the men’s 4x400m relay event. It was set in 1974 at the seventh edition of the Asian Games held at Tehran, Iran, by the quarter-miler relays runners comprising of Ong Yeok Phee, Cheah Kim Teck, Godfrey Jalleh, and Canagasabai Kunalan. Except for Kunalan who was 31-years-old then, the rest of the relay runners was in their early 20’s. You could say it was a blend of youth and experience, and the relay team was confident going to Tehran despite posting a slow 3:17.4 timing at the MAAU meet in Kuantan two weeks before the 1974 Games. The Malaysian meet did serve a purpose for then the national relays coach, Patrick Zehnder, as it gave him and the association some time to tweak the team. 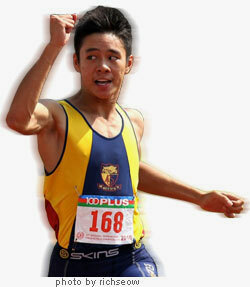 Yeo Kian Chai who was the usual quarter-mile relay runner, was off-form in Kuantan. He was split at 52 seconds for his leg, and was subsequently replaced last minute with the inclusion of Army officer Cheah Kim Teck. With Kunalan back from ‘retirement’; who anchored the 4x400m relay team to silver the year before at the SEAP 73’ Games on home turf with a then new national relay mark of 3:11.3; and the talented 20-year-old Godfrey Jalleh who posted sublime times of 47.6 and 47.8 seconds at the National Open in June, 3-months before the Asian Games, spirits was high among the relay team members. The relay quartet from Singapore was expected of a medal prospect by the media and national bodies, hoping that they will emulate their 1966 Asian Games exploits. The team of Bava Natahar, Gunasena Migale, Ho Mun Cheong and Canagasabai Kunalan earned an Asian Games bronze in the men’s 4x400m event then (3:14.4). 60-strong Singapore contingent was sent to Iran, eleven of those were formed by the athletics squad. Managed by then SAAA secretary K.L. Venugopalan, and under the watchful eyes of Coach Patrick Zehnder, the contingent delivered one gold, three silvers, and seven bronzes. Half of the total medals from the Asian Games 74’ edition, apart from swimming, the haul came from athletics. The precious sole gold came from former track golden girl Chee Swee Lee who romped away to an Asian gold medal in record time for the 400m women’s event. As for the quarter-mile relay team, they finished fifth; the result however didn’t paint a true picture of how close the team was in getting an Asian Games medal. In fact the bronze medal was separated by just a few hundredths of a second between four teams. The Sri Lankan in the finals was too strong and too fast, and they deservedly won gold with a new Asian Games record time then of 3:07.40, while India could only trail behind the Lankans and had to settle for the runners-up position. The Indian relay team finished in a time of 3:08.73. But the third spot was hotly contested by teams from Iraq, Iran, Japan and Singapore. Fortune wasn’t favoring the Iraqi team as on the last final lap, their penultimate runner, sprinting down the stretch in the lead for bronze just collapsed agonizingly five meters from the finishing line. The team from Iran considered themselves lucky to have gotten bronze with the Iraqi relay team member collapsing. They ended the thrilling race with a time of 3:10.10, with Japan closely behind posting a time of 3:10.48 in fourth position, and team Singapore finished disappointingly fifth. Although faltering to prior expectation before the games for a medal; their consolation was a new national mark of 3:10.55 for the quarter–mile relays event. Until now, 37-year-old later the mark is one of the long standing Singapore athletics record that still remains unbroken. The closest timing that the current 4x400m national relay squad ever achieved since 1974 Tehran games record-breaking run was at the SEA Games 2007 edition. The team comprising of Alex Teng, Poh Seng Song, Kenneth Khoo and Muthukumaran finished in a time of 3:13.70 and even then the timing could only muster a fifth placing only. Local athletics which has been in the doldrums in recent times needed a wake-up call, and it came in the form of the newly-elected Singapore Athletic Association last year. Since then efforts have been made to aid in the cause of not only the 4x400m relays, but athletics in whole. A more proactive SAA management recently setup a SEA Games time-trial for the 4x400m relay team at the SAA Track & Field Series #3 held on 2/3 April. Three teams was lined-up for the race, and the eventual winner was finally clocked at 3:19.99, only the second team this year to go below the 2011 SEA Games qualifying mark of 3:26.46. The provisional national 4x400m relay team goes below sub-3:20 minute during a specially held SEA Games time-trial at the SAA T&F Series #3 at Nanyang Poly earlier in April. From the left, schoolboy Ng Chin Hui (17 yrs), Republic Poly’s Zaki Sapari (18 yrs), PE teacher Kenneth Khoo (29 yrs) and NUS undergrad Lance Tan (24 yrs). If it’s any indication that a revival is in store for the quarter-mile event, it lies with our young crop of junior athletes. 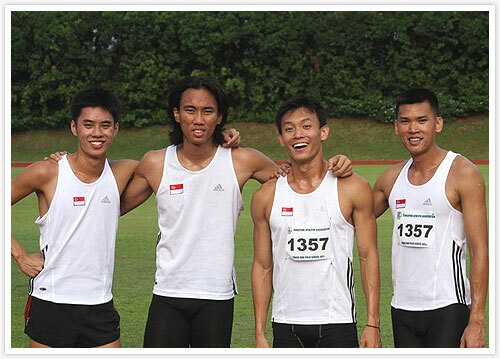 At the recent SPH Relays held in March, the Raffles Institution 4x400m relay was the first Singapore team to qualify for the SEA Games 11′. The schoolboys finished in a time of 3:24.40, eclipsing the SEA Games qualifying mark by some two seconds. The RIJC coach, Melvin Tan, who is also the national relays coordinator was “pleasantly surprise” of his young charges achievement. While qualifying for the SEA Games is an important milestone, to qualify with merit and with a medal fighting-chance is a whole another matter. You don’t want to be sent for a competition, and be the whipping boys. The top-three average times for SEA Games 4x400m relay men’s event spanning from 2005 to 2009 are as follows. The gold at 3:08.50 minutes, the silver at 3:09.65 minute and the bronze at 3:19.42 minute. While 3:19.42 minute seems like an achievable timing by our current standards, heck our junior ASEAN School team themselves managed a 3:20 minute timing last year, the association and the relay squad members however has set their sights higher. The best form of response to the critics and in term of progress is to break the long-standing national 4x400m men’s record itself. On paper, if based on the current 400m season-best men’s rankings, the top four runners would need to cut down at least 2 plus seconds off their current form to challenge the record. The fastest 400m runner this season so far are schoolboy Ng Chin Hui‘s 48.76 seconds set at Taiwan Open, Kenneth Khoo (48.78 seconds, Malacca Open), and Seow Yeong Yang, who clocked 49.35 seconds at the 52nd National Schools. To go below the national mark of 3:10.55, each of the four relay members would need to at least run 47.63 seconds per leg, and based on the current crop of Singapore quarter-milers 400m individual ranking timings this season, it won’t be any time soon. 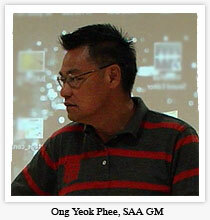 However, SAA general manager Ong Yeok Phee who was part of that record breaking 4x400m relay run in Tehran, he believes otherwise. Yes it’s this mindset that the new relay team members have to instill. The Singapore men’s relay squad has a knack of performing below their potential, only to become the surprise package at competitions. It seems we’ve a history of performing better under pressure at big meets. For example in 1966, the relay team could only manage 3:16.8 timing in a time-trial, but ran a sublime 3:13.4 at the 1967 SEAP Games held in Bangkok for the bronze. Another instance was clocking 3:17.4, also in another qualifying mark time-trial for the 1969 SEAP Games, and the team successfully captured gold in Rangoon with a time of 3:15.4. The 1974 Asian Games was the kicker in terms of improvement. The team was only able only to clock 3:17.4 in a state meet, but two weeks later in Tehran, Iran, the team ran to a new national mark of 3:10.55. That’s a vast improvement indeed. The hopes of collecting medals in athletics starts now, and let’s not leave it too late when it comes to qualifying for a competition. Of course the next thing our current quarter-miler need are high-level competition to bring out the best in them to break the record, and the current 4x400m relay team has been given a lifeline in terms of qualifying for this year SEA Games, where there have been six successful attempts clocking below the 3:26.46 qualifying time. As for the current 4x400m relay team, when asked of the relay team plans, the captain of the squad, Kenneth Khoo has set a modest timing of 3:16 as their next target this year. The below question was posed in mid-march before the 52nd National School 2011. Q) Team RIJC demolished the old SPH relay 4x400m A Boys records by some three seconds plus. Did you guys were expecting such a fast timing? Ng Chin Hui: Well we were expecting to better the time of 3:26.46 so it wasn’t much of a surprise to us. My split was about 49 seconds flat. Q) What was your reaction when told that the team have gone under the 3:26.46 SEA Games qualifying mark? Ng Chin Hui: We were very happy, because it’s no mean feat for a school boy team to qualify for the SEA Games! Q) What was or were the team pre-race tactics? Ng Chin Hui: It was pretty simple, my job as the second leg runner was to secure the lead and open up the gap. Then the rest would maintain it. Q) Given that you’re in JC, and will your exams clashed during SEA Games period? Will you still be trying out for the 4x400m national team slot, hoping for a place at the SEA Games in Palembang? Ng Chin Hui: As I’m currently in JC year one, my exams wouldn’t clash with the SEA Games so I’m definitely gunning for it. Q) What are your expectations for Team RIJC for the upcoming Nationals, be it overall, and the 4x400m team. Ng Chin Hui: Well I do hope we can defend overall double titles as well as break the 4x400m record which stands at 3:22 if possible. New SPH relays Championship Record: Boys 4×400 Meter Relay A Divison by Raffles Institution Junior College (3:24:40), ran by Calvin Khor, Ng Chin Hui, Khong Zhiwei and Seow Yeong Yang. Q) Post-Race, what do you think of your run? Did it met the team goals & expectations set by the coaches. Kenneth Khoo: With qualification already secured earlier, I guess nobody really set any expectations on us. It was just a race to see how fast we could push the timing. However, with the kind of line up we had, we ought to be running sub 3:20 easily & I’m just glad to meet this target by a whisker. Lance Tan: I had a terrible individual 400m the day before, but I think I ran much better during the relays. Personally I targeted a timing to be sub-3:20, which was a 50s average. Q) Can we get better & faster? In your case, how. Kenneth Khoo: Not just me, everyone will be running faster. It’s still early in the season after all. We’ve had some changes in the training where we went back to pre-season again. But that phase is over now and we should be expecting faster times with more specific workouts. Lance Tan: The push during the trial was good, but nothing beats running a race with stronger opposition. That will bring the times down. As for myself, I am still in the loading/pre-season phase. I expect us to improve once I get down to specific training. Q) What was the race tactics? Kenneth Khoo: It was great that the other team gave us the push they did. They ran their hearts out & always put pressure on us. We wouldn’t have run this timing without them. The whole plan for us was just to keep up & push ahead. Lance Tan: After running so many 400m races, I just ran. I’m truly appreciative of the runners from the other teams who gave us a run for our money. It gave us that additional push to dip below 3:20. Q) What’s the aim for 4x400m national team this year? Kenneth Khoo: Definitely a medal. The 4x400m team have featured in the SEA Games quite a bit these last 10 years & we should really stop giving ourselves the excuse that we’re there for experience. We should be challenging & putting pressure on our regional rivals. Lance Tan: I hope everyone will only get stronger and faster. The major aim is definitely to run a sub 3:12 and hopefully bring some glory to Singapore at the upcoming SEA Games. Three teams were running in the SEA Games time-trial. Much was expected of Team A, and they duly delivered, considering it’s still early in the competition season. Update: Team Singapore 4x400m ran a new season-best in Taiwan 3:15.09, May 27th. This article was written on 26th April, and was delayed in publishing due to unforeseen matters, thus some of the content might seem ‘outdated’.